First appearing in Alice in Wonderland, Bill the Lizard went on to appear in other Disney cartoons as well. 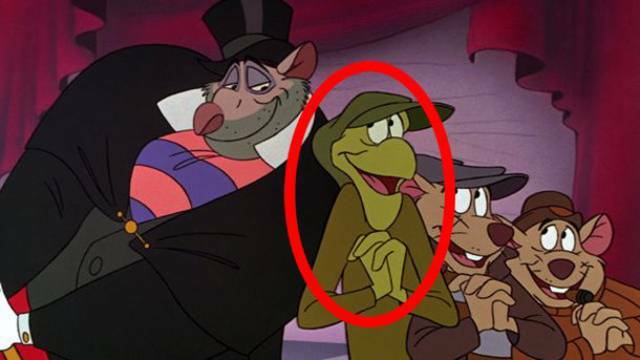 You can find him as part of Ratigan’s gang in The Great Mouse Detective. We all know and love Tinkerbell from the Disney classic Peter Pan. But, Peter Pan isn’t the only place she’s appeared. 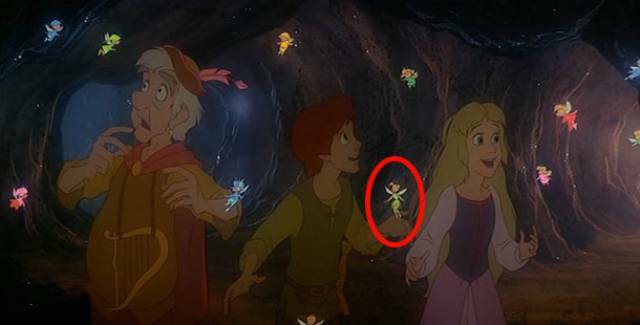 She makes a brief cameo in the lesser known Disney cartoon The Black Cauldron. We’re not exactly sure how Goofy, Mickey, and Donald could breathe underwater while King Triton swims into his kingdom. 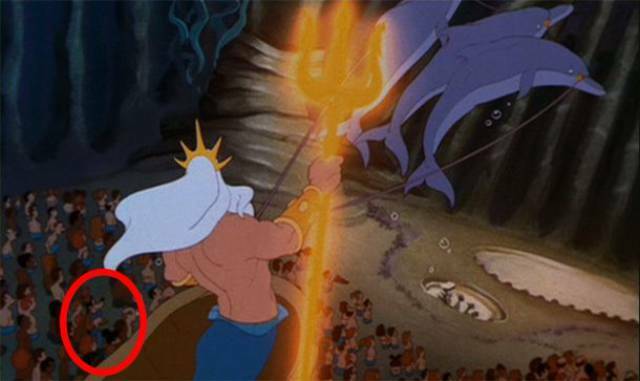 Nevertheless, if you watch closely, you’ll find them among the audience in The Little Mermaid. Ever wonder what happened to Scar from The Lion King? Okay, probably not since he’s the murderous villain. Regardless, his fate isn’t pleasant. 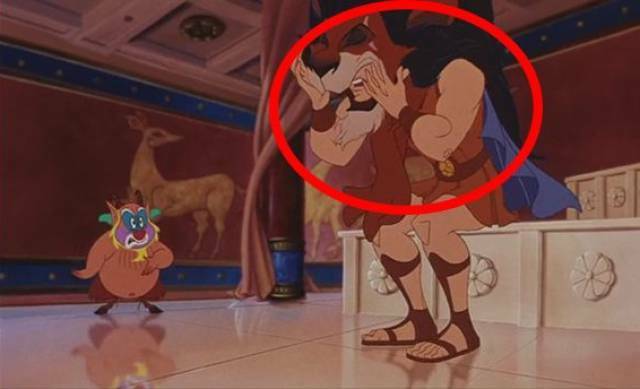 He makes an appearance in Hercules as a lion rug. 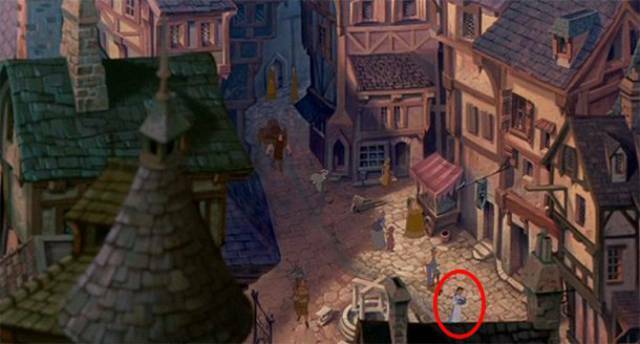 Since both The Hunchback of Notre Dame and Beauty and the Beast both take place in France, it’s kind of a no-brainer to put Belle in The Hunchback of Notre Dame. Indeed, she appears during the second musical number called “Out There.” Look closely, and you’ll find her walking and reading a book. 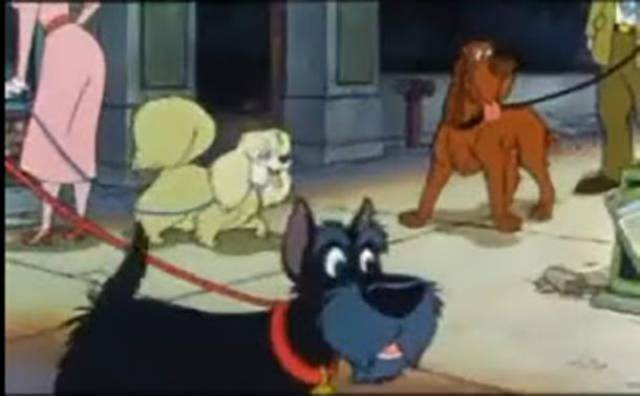 Adapted from Charles Dicken’s classic Oliver Twist, it feels like forever since Oliver & Company was first released. 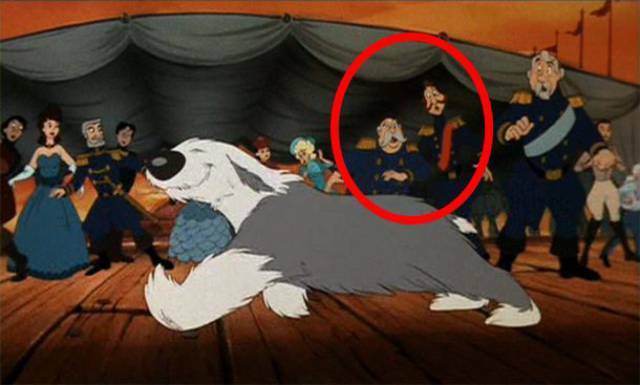 However, if you want to travel back down memory lane, you’ll also find that Trust, Peg, and Jock from Lady and the Tramp make a brief cameo. 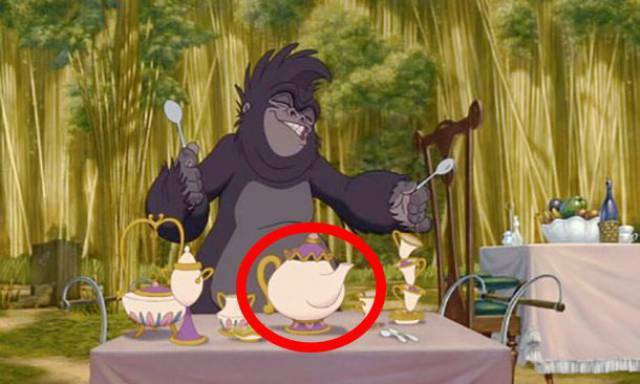 Mrs. Potts from Beauty and the Beast has made several cameos in other Disney movies but none more striking than in Tarzan. You’ll find her on a table with what looks like Chip and other pieces of dinnerware in Jane Porter’s camp. 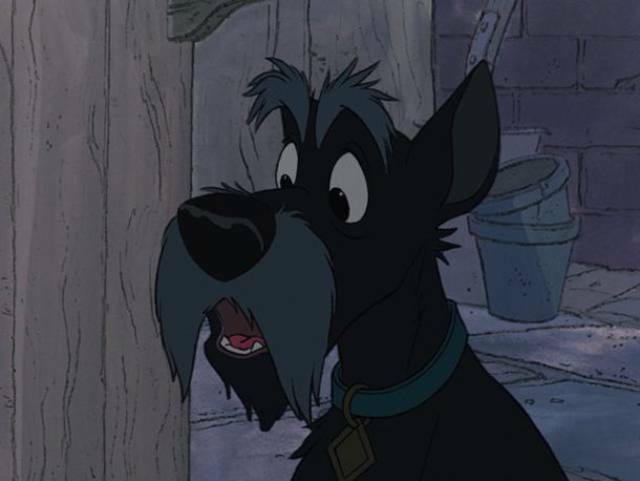 First appearing in Lady and the Tramp, Jock went on to cameo in 101 Dalmatians. He’s the first dog to pick up on the Great Dane’s bark during “The Twilight Bark” sequence. Though Magic Carpet doesn’t speak, it’s become a fan favorite in the Disney world and has made plenty of cameos. 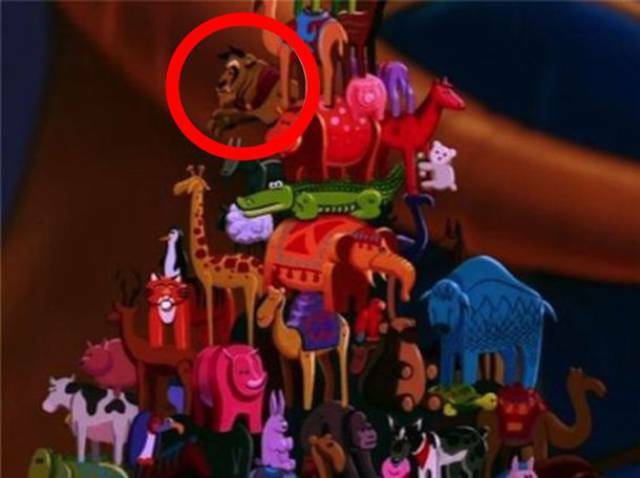 One of those cameos is in the movie The Princess and the Frog. 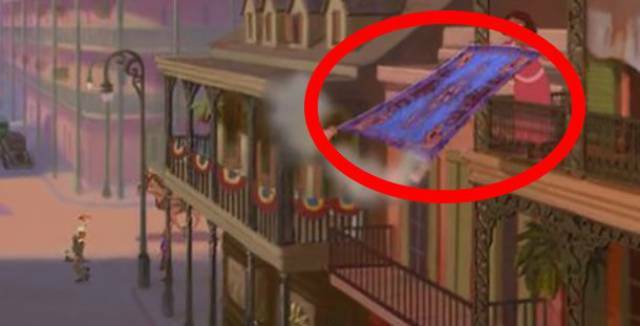 When Tiana is going to her second job, Magic Carpet is the floor rug an old lady is shaking out. The Little Mermaid has plenty more cameos. 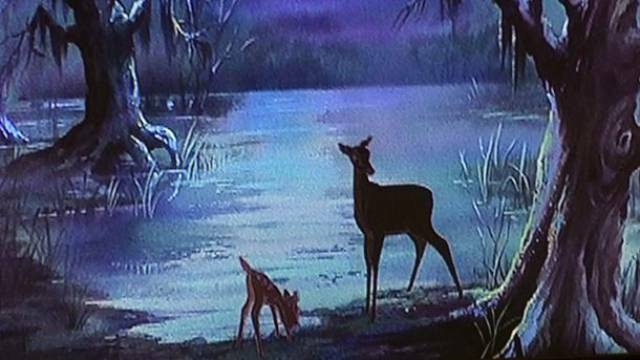 At the very end of the movie, when Prince Eric and Vanessa are getting married, you’ll be able to see The King and Grand Duke from Cinderella attending. Technically, this is more of an easter egg than a character cameo, but we’re going with it anyway because it’s pretty cool. 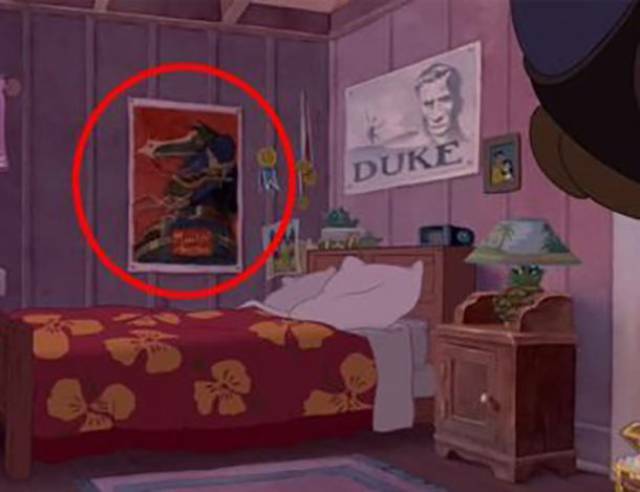 In the movie Lilo & Stitch, you’ll find a Mulan poster hanging up over a bed. In The Princess and the Frog, Louis the alligator does something quite peculiar. He scrunches up swamp grass and places it to his head while making a weird face. 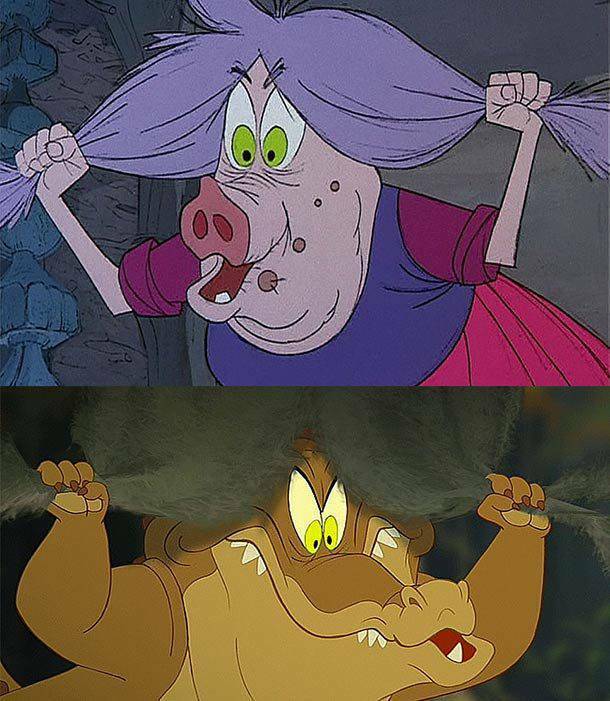 This is a direct impersonation of Madam Mim from the movie The Sword in the Stone. In Aladdin, you might remember how fond the sultan was of playing with tiny toy figurines. Well, in the scene where he’s stacking them on top of each other, you’ll be able to catch the Beast from Beauty and the Beast as one of the toys. While young Jim Hawkins is sleeping in Treasure Planet, you might want to take a quick look at his bookshelf. 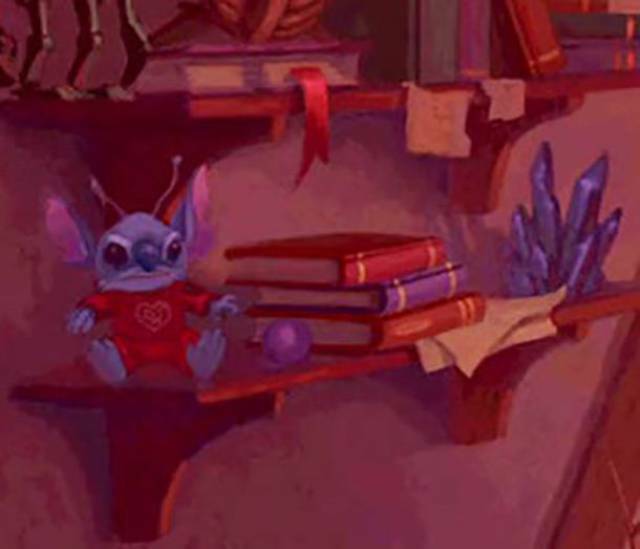 There’s a plush doll of Stitch sitting soundly next to a stack of books and underneath a robot. Everyone knows and loves the Pixar Ball that goes bouncing into frame during each and every Pixar title. 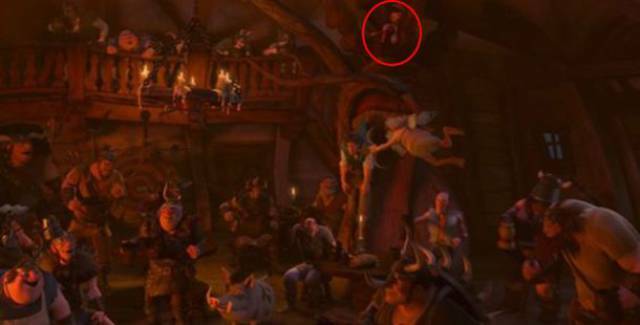 Well, believe it or not, it’s made cameos in Disney’s cartoons, including sitting on a stool in the background in Lilo & Stitch. Who can forget the lovable if sometimes annoying Sebastian from The Little Mermaid? 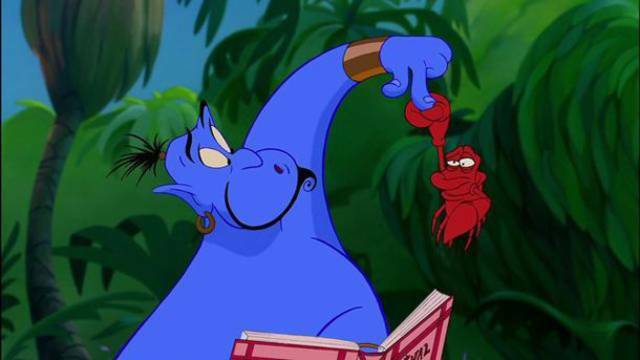 Blink and you’ll miss it, but in the scene where the Genie is looking for recipes to turn Aladdin into a prince, he suddenly pulls out Sebastian, and Sebastian does not look pleased. Lilo & Stitch is full of fun Easter eggs. In this case, Dumbo makes an appearance. 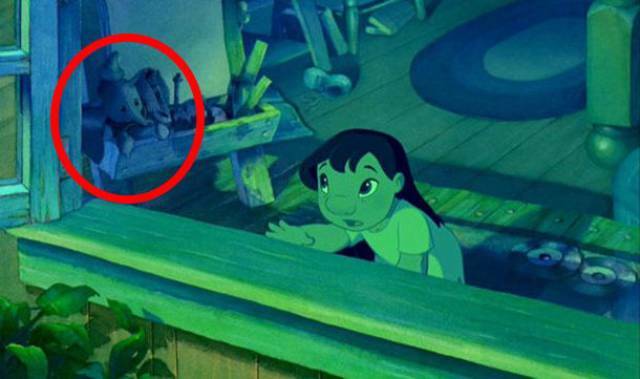 If you look closely when Stitch first lands on earth, you’ll see a Dumbo doll sitting on Lilo’s easel in the background. You might remember the Pizza Planet Truck first appearing in Pixar’s Toy Story. 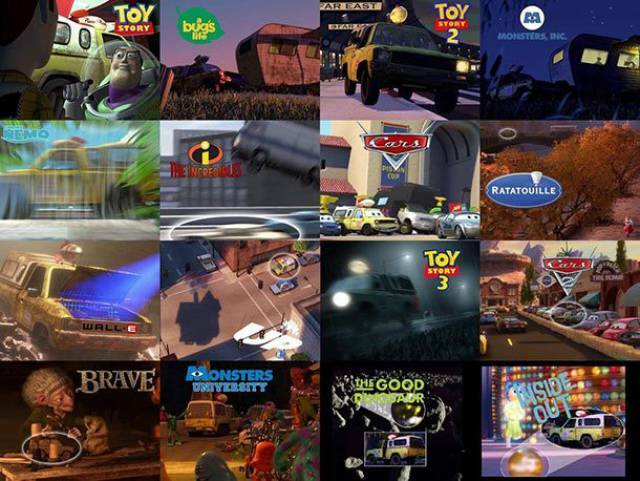 But would you believe it’s been in virtually every other Pixar film since then? From a Bug’s Life all the way to Monster’s University, the Pizza Planet Truck is usually hiding somewhere in the background. This one is much trickier to spot, but in a Ratatouille scene where Remy runs through an apartment, you might catch the shadow of a dog on the wall. That shadow is none other than Dug the talking dog from Up. In contrast, this one is super easy to find. 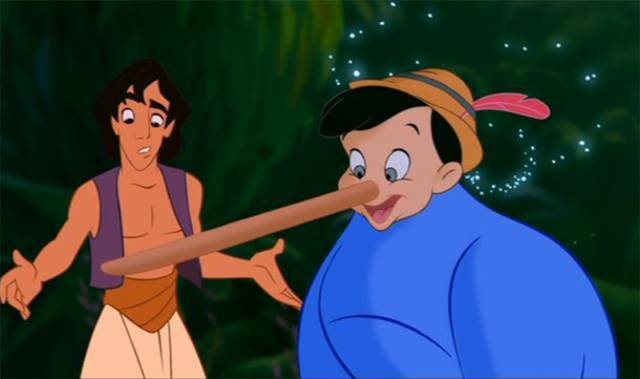 In an Aladdin scene where the Genie is calling out Aladdin for lying, the Genie does an impression of Pinocchio with a very long nose. 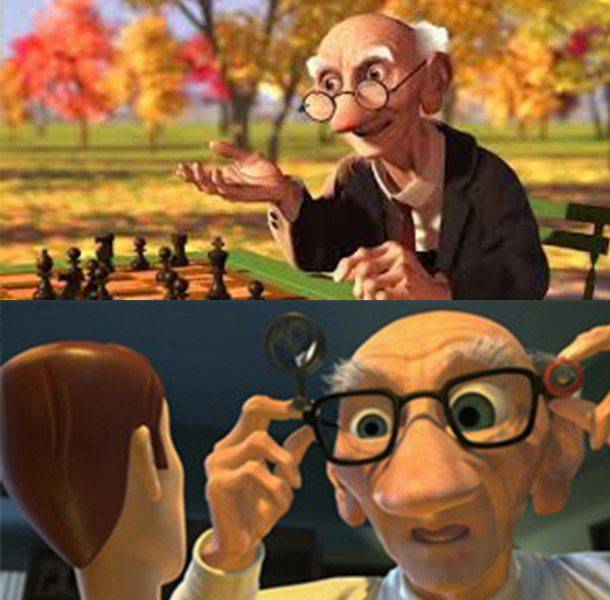 Geri first appeared in the short film Geri’s Game, where he played a game of chess by himself. However, you’ll probably know him better from his appearance in Toy Story 2. He was the old man who came to fix Woody. When Nemo in Finding Nemo ends up in the dentist’s office, you might see off in the corner a treasure chest. 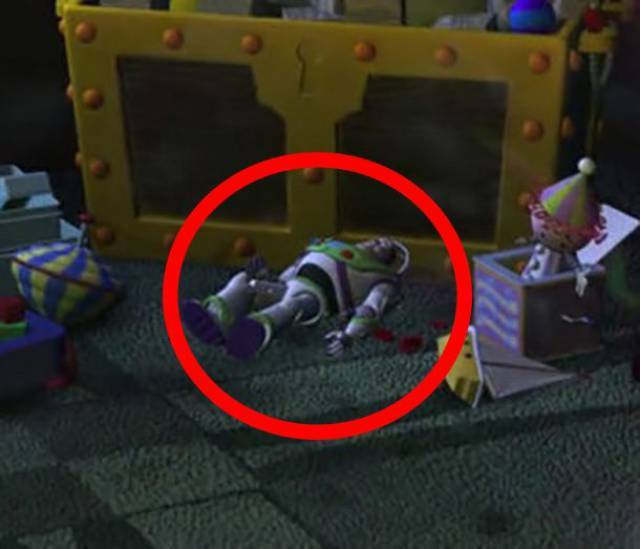 On the floor, Buzz Lightyear is laying next to a jack-in-the-box. 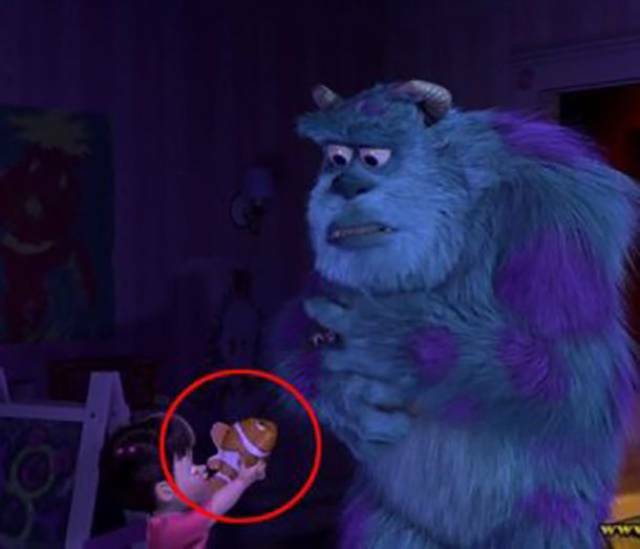 Monsters, Inc. has plenty of cameos. In this case, Nemo from Finding Nemo, makes a short appearance. 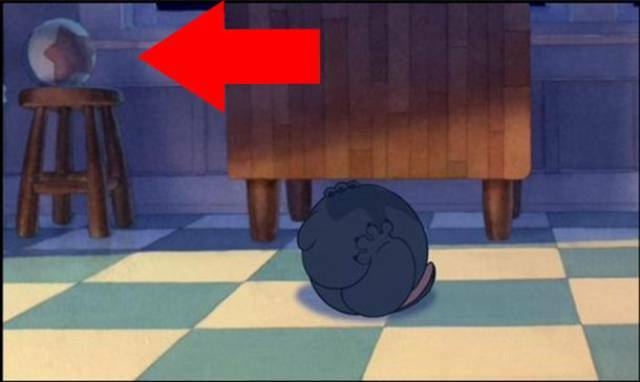 You can find it in the scene where Boo and Sulley are in Boo’s room. Boo hands over a life-size fish toy of Nemo. oh no , not again ! ?